Clean tunnels mean more safety, because the tunnel and all its facilities are brighter and more visible. That's why ASFINAG has tunnel wash days twice a year - in spring and in autumn. 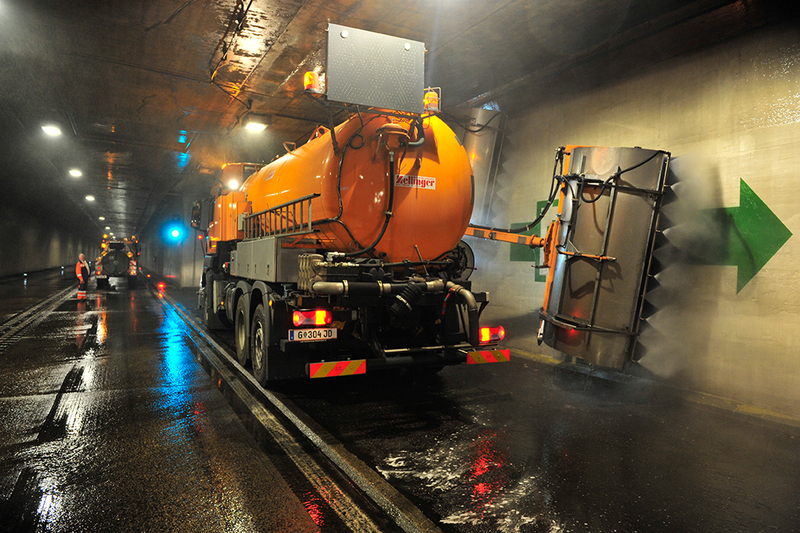 All of our 164 tunnels are cleaned, and the dust and soot is removed from the walls. Sometimes up to 70 people clean the tunnel at the same time. From the curb reflectors and the lighting to the emergency phone niches and the video cameras - everything is cleaned and broken parts are replaced. Drawing up the tunnel wash schedule is also a big challenge. While these steps are necessary for road safety, there must be as little obstruction as possible to the traffic. That's why this work is largely carried out at night. As a sustainable company, ASFINAG also ensures that its waste water is cleaned properly. After the addition of flocculating agents, the dirty waste water from the tunnel is pumped through a four-stage filter system and cleaned. The resulting water has drinking water quality and is returned into running waters in this cleaned state.